Training Material for developing strong problem-solving and decision-making skills. Train employees and managers eight essentials to defining a problem, types of decisions, the problem-solving model, how to analyze and select solutions and more! Seeing is Believing This sample manual to teach Problem Solving and Decision Making is in MS Word format. Teaching decision making skills can be difficult, especially when everyone comes to class equipped with their own unique skills for problem solving and decision making. That's why Velsoft's Problem Solving and Decision Making training material offers a flexible model and a large problem-solving toolkit, making it easy to teach effective decision making and problem solving strategies for business! Students will learn how to identify the root causes of a problem and identify the best solution to them; how to improve their personal problem solving style; and tools and techniques for decision making that result in sustainable solutions and prevent problems from reoccurring in the future. 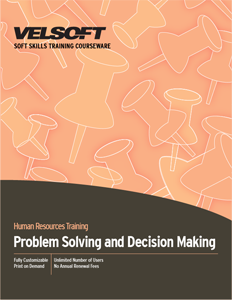 Problem Solving and Decision Making Training Materials are full of rich content and activities on using problem solving techniques for the workplace and making great decisions. We also include strategic problem solving models and tools to teach students how to arrive at effective and creative solutions. All of our training material is fully customizable and can be combined with eLearning, Velsoft's blended learning solution that makes teaching problem solving skills in business even easier! No problems are permanent-buy now and see what solutions are waiting to be discovered!